I'm not sure that the ride has a name yet, but the new B&M Wing Coaster at Germany's Heide-Park is testing and looks pretty slick while showing off its moves! 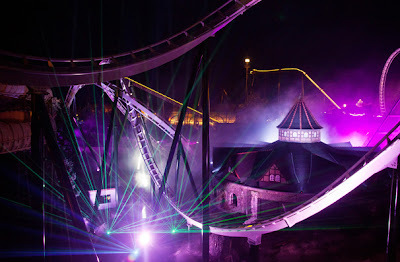 The coaster is the seventh of the variety built by B&M so far, and with the popularity found among the general public I'm sure we will see plenty more in the future. 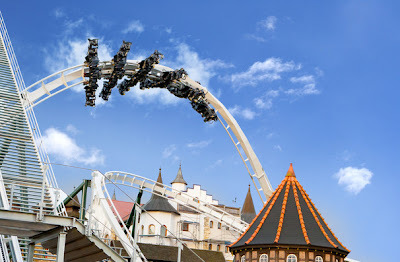 Like several of the other B&M Wing Coasters, the ride at Heide-Park features plenty of "close calls" that make it look like the train will collide with scenery along the track. Here the train flies through a building - it is sort of funny how you can see the opening is cut in the exact shape of the clearance tester they used! Of note is that the trains appear to only use six cars, instead of seven or eight like on other Wing Coasters. 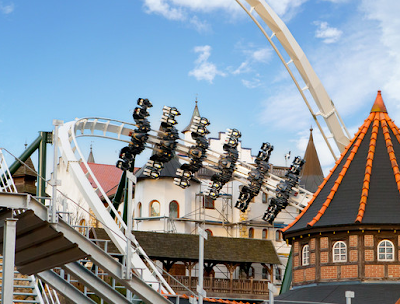 Perhaps this is because of the tight design that the Heide-Park ride has, including twisted elements that appear in photos to be smaller than average. Or perhaps just to save money! Here's another close call element, where the train will dive beneath this bridge that was just recently installed. 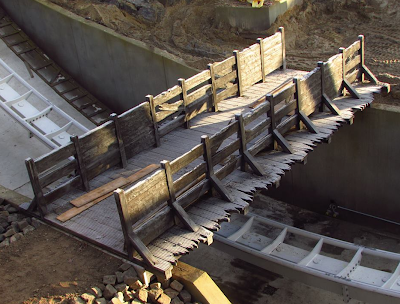 The original press release mentioned that there will be a total of six near miss elements spread throughout the ride, so designers are certainly taking full advantage of the coaster's slim trains. 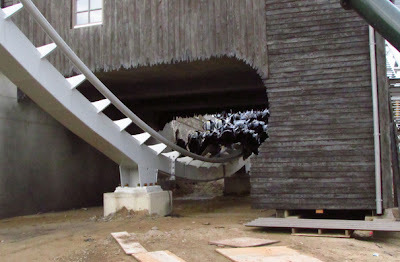 One final shot, here the park prettied up the coaster for their recent Halloween events. The lights are quite fitting since the ride appears to have some sort of dark theme to it, with ruined castles and other creepers featured on the website. With the ride looking almost ready to open, we will sit tight for a few months and then be able to check out the finished product.